This Arabic chapter book narrates the biography of the man who developed the Braille system of printing for the blind. 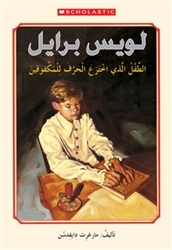 The book is well-written in Arabic, with clear short sentences, and entertaining style. The story line makes this book a page-turner. Suitable for readers ages 9 -12, this Arabic biography is now available on our online bookstore.